Unrehearsed comments from top styling experts: “Town car excellence” … “Crisp simplicity of line” … “The formal look with a sporting flair.” We think you’ll agree with the experts. And you’ll also agree that our new Chryslers are far more than styling winners. Underhood you’ll find only V-8 engines that range from the economy of Newport (it uses regular gas) to the sports-bred 300 and the spirited luxury of the New Yorker. Again this year, your investment will not be undercut by a jr. edition – we don’t build them! And, climbing Chrysler resale value is proof of this protection. Crisp, new styling. Exciting performance. Lasting investment value. 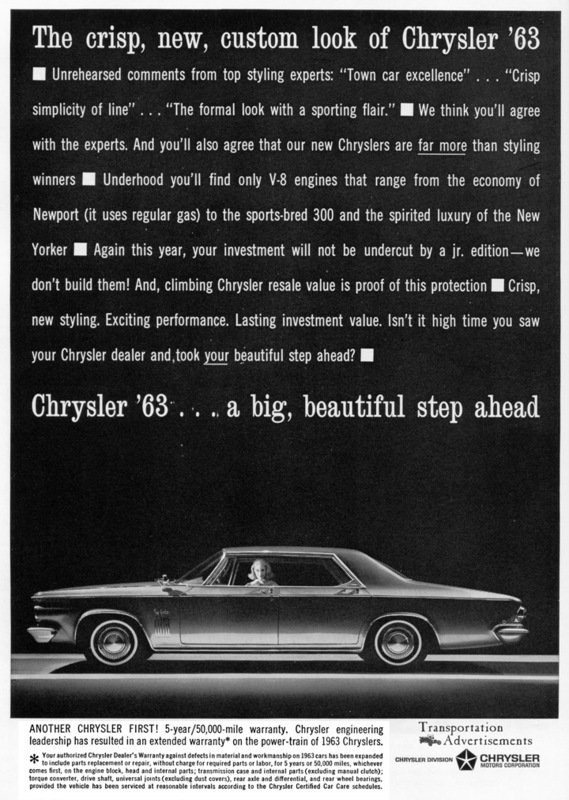 Isn’t it high time you saw your Chrysler dealer and took your beautiful step ahead? Another Chrysler first! 5-year/50,000-mile warranty. 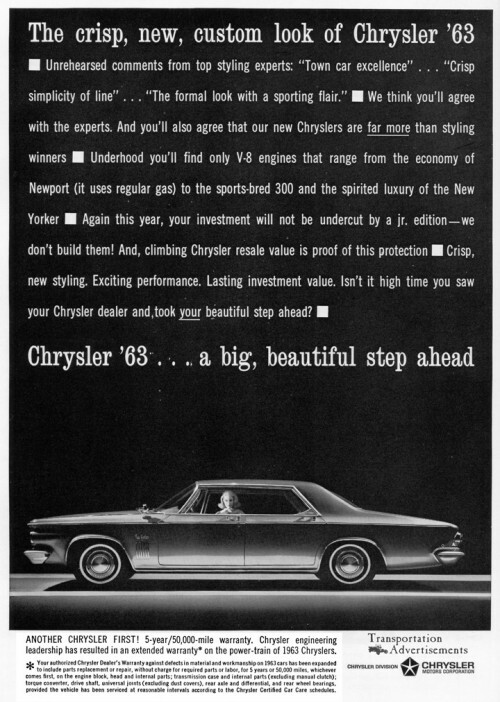 Chrysler engineering leadership has resulted in an extended warranty* on the power-train of 1963 Chryslers. * Your authorized Chrysler Dealer’s Warranty against defects in material and workmanship on 1963 cars has been expanded to include parts replacement or repair, without charge for required parts or labor, for 5 years or 50,000 miles, whichever comes first, on the engine block, head and internal parts; transmission case and internal parts (excluding manual clutch); torque converter, drive shaft, universal joints (excluding dust covers), rear axle and differential, and rear wheel bearings, provided the vehicle has been serviced at reasonable intervals according to the Chrysler Certified Car Care schedule.